"We wish to have some fun in this paper.... We shall try to domesticate as much as possible of the casual cheerfulness that is drifting about in an unfriendly world.... We shall have something to say about religion, about politics, fashion, society, literature, the stage, the stock exchange, and the police station, and we will speak out what is in our mind as fairly, as truthfully, and as decently as we know how." 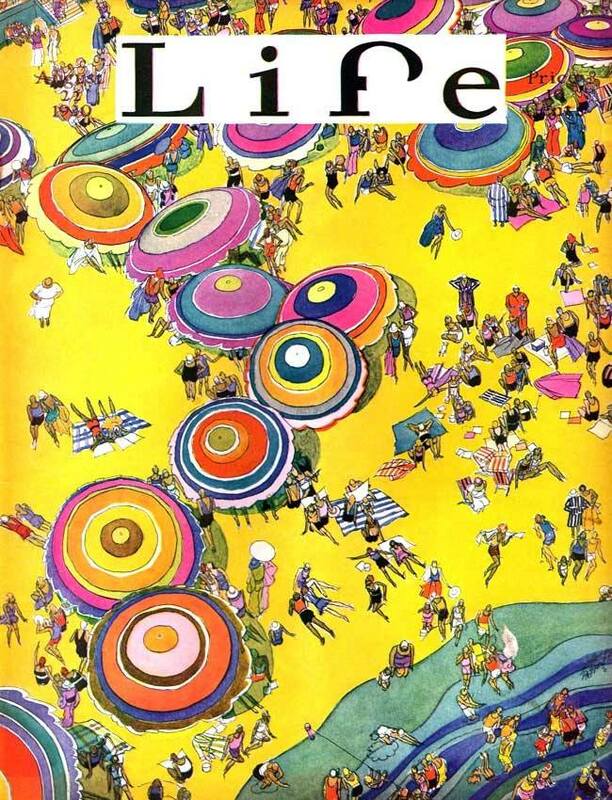 The August 22, 1930, cover of Life, shown above, is certainly fun. I love the myriad colors of the umbrellas and the way they pop out against the bright-yellow sand. The level of detail is tremendous, too. The artist is Russell Patterson (1893-1977), who did numerous covers and illustrations for this early iteration of Life. Patterson became famous across many platforms — magazine illustrations, Hollywood costumes and set designs, cartoons — but was perhaps most influential for his style of drawing women and their outfits and accessories. His illustrations helped to affirm and even create fashion trends, especially that of the flapper. You can browse other early Life covers — and there are many that are super-cool — at 2Neat Magazines. Note: This is one of those rare ephemeral items that I post despite not actually having it in my possession at the time. It was just so cool that I wanted to share. I originally came across it on Pinterest.